Another year at OSP, my 15th in a row. I've gone through a lot of changes and gotten a lot older since my first trip here in 1994. Geez, I was in college then. My interest in astronomy has fluctuated quite a bit as well. I remember the late 90's and early 00's with my 60mm "Scope of Death", 2003-2005 when I was hunting down galaxy groups with my new 10" Dob, and the last couple of years when serious astronomy has been pushed down the hobby list a bit. This year, I have a real full-time job for the first time since 1999. For a variety of reasons, I haven't done many long observing sessions in 2008. But since I'm eligible for vacation and holiday pay, I guess you could say that I'm getting paid to go to OSP. So, on to the fun! OSP photo companion on Flickr. Plus, here's a special OSP Pano (1 MB). Check it out! The long-range forecasts looked pretty iffy; there was a chance that my first night would be the only decent observing night. With this in mind, I decided to throw everything I had at my "serious" observing project: see as many comets as I could during OSP. Before it got dark, however, I couldn't resist taking a peek at Jupiter. The giant planet has been low in the southern sky for several years, and I haven't really seen much detail on it this year. 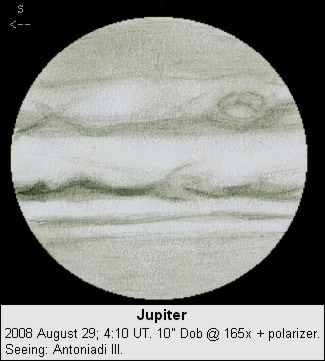 But OSP has a better chance of steady skies than does my back yard, and Jupiter looked pretty decent. The next two comets were pretty easy. I had already observed C/2007 N3 (Lulin) from my backyard. Tonight, the comet was clearly visible. It was fairly bright and condensed, with a prominent stellar nucleus and bright inner coma. The coma was about 2.5' in diameter, fanning into a short tail about 5' long and pointing to the ENE. 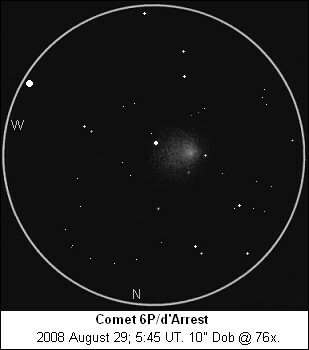 Comet 6P/d'Arrest is a short-period comet and an old friend that I first observed in 1995. It was slumming in the obscure constellation of Microscopium. I could make out its fuzzy coma in binoculars, right next to a field star. In the 10" Dob, it had a bright but not very condensed inner coma and a larger diffuse outer coma fanning toward the west. Total coma diameter was about 7.5'. My remaining comets were morning objects, so I took a little time off to observe a couple of faint galaxies. 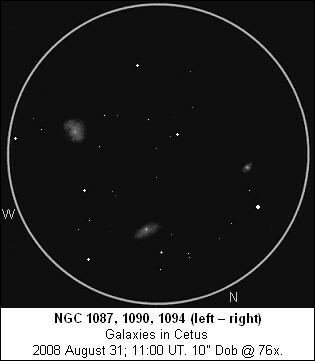 NGC 6822 (Barnard's Galaxy) is worth an annual visit at OSP; I sketched it some years ago in my 60mm refractor. IC 10 is a galaxy that I don't remember seeing before. Both were on the "Snow White and the Seven Dwarves" list prepared for this year's OSP, a list with a couple of low surface brightness galaxies that I was ultimately unable to pick out. 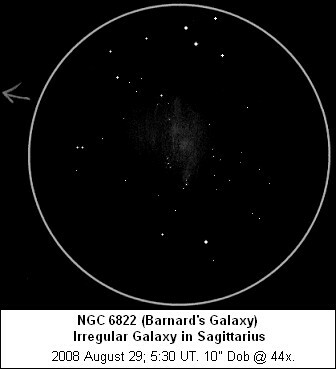 Barnard's Galaxy in Sagittarius is very large and diffuse, extended NNE-SSW in a very rich low power field. It appears kind of granular, with some streaky structure and a couple of brighter patches. IC 10, in Cassiopeia, is also in a very rich star field. It is small (5' x 3.5'), with a low surface brightness and hints of an irregular shape. A couple of stars are superimposed. Sky conditions were pretty average for OSP; I did a couple of limiting magnitude counts early Friday morning and came up with 7.1. There were some brief flickers of auroral glow in the NNE. My first morning comet was C/2008 J1 (Boattini), hanging out near Polaris. For once, my scope's lack of a tracking drive was essentially moot! This comet was moderately condensed and essentially round, with a coma about 4' in diameter and fading evenly toward the edges. 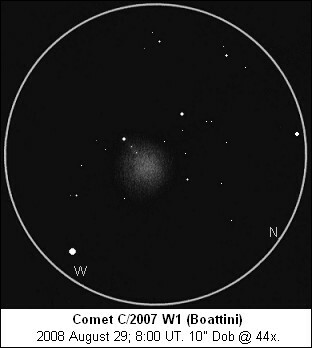 Next up was the other Comet Boattini, C/2007 W1. Just visible in binoculars, it showed a very diffuse and evenly-illuminated round coma about 11' in diameter. 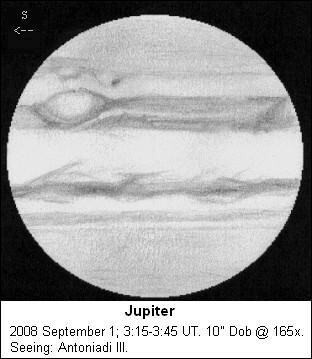 The Great Red Spot (more like a pale eye) was just coming around the limb. The northern portion of the spot looked like a bright white oval, while the remainder was a pale dusky orange. There were some spidery projections from the south edge of the South Equatorial Belt, and hints of disturbances in the belts south of the spot. The North Equatorial Belt, thinner and darker, showed the expected wealth of detail, while the Equatorial Zone was mostly white and featureless. There was a distinct belt north of the NEB, and the North Polar Region showed a fairly sharp and dark southern edge. I had finder charts for 11 comets, none of them extremely bright. Some of them were probably beyond my scope. My first target proved to be a bit too much for me on this night. C/2005 L3, in Bootes, was invisible. One page said it had recently been estimated to be magnitude 12.7, no picnic but do-able with a 10" scope. On the other hand, comets are quite unpredictable. I searched for a while but had to shelve it. My next two comets were located in Camelopardalis. C/2006 W3 (Christensen) was a new find for me. Sandwiched in between a couple of bright stars, it was still easy to see. This comet was very bright and very condensed. Despite its small size, I could see it was clearly nonstellar at 44x. I cranked the power up to 330x and saw a bright stellar nucleus surrounded by a bright coma about 1' in diameter. The coma fanned slightly toward the north. I had observed C/2006 OF2 (Broughton) on a couple of occasions earlier this summer. So I was surprised that I didn't find it on my first try. 15 minutes later, I came back to the field and discovered the comet had been hiding in front of a star. Now that its motion had carried it away from the star, I saw it. Broughton was very strongly condensed with a bright inner coma but no stellar nucleus. The coma was very small (1.5' in diameter) and round, or possibly elongated to the E.
I had a bit of time before my final few cometary targets in the morning sky. I looked at Neptune (plus Triton) and Uranus (plus Oberon). I swept up a few deep-sky objects. Then it was on to Gemini and Cancer, and a couple of comets I wasn't sure I could see. The zodiacal light was pretty bright over there. I struck out on 15P/Finlay and also on 29P/Schwassmann-Wachmann. 19P/Borrelly, another old friend, was much easier despite its low altitude. In my recorded notes, I called it a "mid-sized fluffball with a moderately condensed coma". It was elongated toward the east, but there looked like there was a secondary elongation to the southwest. The coma dimensions were about 3' x 2'. That was about it for the morning. 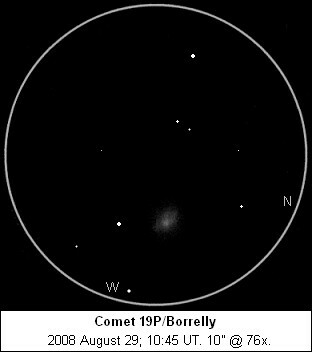 I tried and failed to detect 17P/Holmes, last fall's star comet. I poked around in Orion as twilight brightened. Then I went to bed. The clouds held off for another nice night. I planned a more relaxed, less-structured program. I looked at Jupiter in twilight. There was a lot of Galilean satellite action tonight. Io was invisible in transit when I started observing. First, Callisto disappeared behind Jupiter's limb, and then Ganymede reappeared on the opposite side. Io's clearly visible shadow soon crept onto the disk. Ganymede then slid into Jupiter's shadow, gradually fading out in eclipse. 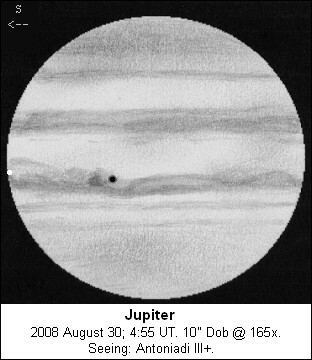 Finally, Io became visible on Jupiter's preceding limb before exiting the disk (sketched above). The seeing wasn't as good as on the previous night, but it was good enough for this show. I had some unfinished business to attend to. C/2005 L3 had eluded me on Thursday evening, so I threw everything I had at it. I felt my vision was pretty dialed in after a day of rest. I was sure I could see something nonstellar in the comet's position at 330x and even at 165x. I just wasn't sure whether it was the comet or a close grouping of two or three stars. The below-average seeing and the comet's relatively low elevation in the west didn't help. I made a sketch of the field, and then called on a big gun for help. When I pointed Dan Gray's 28" scope at the field, I immediately saw a round fuzzy spot at the same place as I had seen it in my scope. However, there was another indistinct and slightly nonstellar object nearby. Which one was the comet? Dan obliged my curiosity by taking a 40-second CCD exposure using his 14" "lollipop" scope. The other object was a lens-shaped galaxy, and the comet even sported a very faint tail! 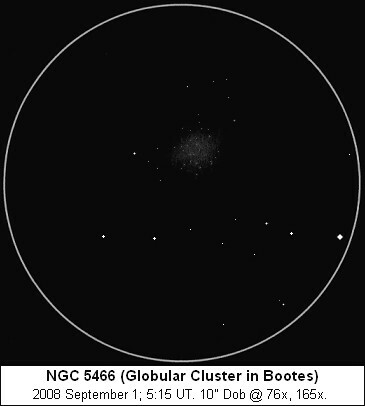 Dan's planetarium program revealed the galaxy to be PGC 53150, listed at magnitude 16.2. I assume this is a blue magnitude and the galaxy is actually about 1 magnitude brighter visually. The rest of my observing was pretty low-key. I picked off the Pegasus Dwarf Galaxy, which was no problem to see as a faint smudge about 6' x 4' with a slightly brighter center. I did a deep viewing session around the Ring Nebula. The central star popped in and out with averted vision. Stars of magnitude 15.6 and 15.7 were readily visible just outside the ring, and I was able to go down to 16.1 and occasionally 16.6 with a lot of effort at magnifications of 330x and 390x. The nearby galaxy IC 1296 has become a regular target for me at OSP and other really dark sites; it wasn't much of a problem. I took the obligatory looks at the Veil and other goodies in the summer Milky Way. Again there were some brief auroral flickers. The gegenschein and zodiacal band seemed particularly well-defined Saturday morning. Before twilight, I made an attempt at comet 15P/Finlay and thought I glimpsed it as an extremely diffuse glow. Unfortunately, I wasn't able to repeat this feat on either of the subsequent two mornings, so I'll have to chalk it up as a possible sighting. The sky brightened again. The International Space Station made a nice pass at 5:48am, and I got a couple of pictures of it rising above the telescope field. This was more or less an off night for me. There were some clouds from time to time, and they always seemed to be in the way. The wind was a nuisance, and the seeing didn't seem to be too good. I stuck it out for a couple of hours and then took a nap. When I woke up, the sky still didn't look too great, but I decided to do a meteor watch anyway. I started at 2:25am with the wind still blowing a bit. Over the next hour, I counted 25 meteors. Most (15) were sporadics, but there were 3 from the Anthelion radiant, 4 September Perseids, and 3 Alpha Aurigids. Limiting magnitude counts in Andromeda and Pegasus yielded a figure of 7.2. During the count, the wind died down and dew formed. Eventually the dew turned to frost. For the rest of the morning I poked around at some pretty random targets. I spent some time in Cetus and sketched the galaxy trio of NGC 1087/1090/1094 near M77. I tried and failed to see comet 15P/Finlay. I went to sleep. Sunday was the day the weather changed. Almost everybody left. Staying was a pretty easy decision for me since I had Monday off and there wasn't anywhere I was anxious to go on a crowded Labor Day weekend. Mostly the day was cloudy and windy. I took a hike around the site, listened to music and an audio book, and waited. In the late afternoon, some showers passed pretty close to the site, but missed it. When a rainbow appeared, I took that as a good sign. And indeed the sky cleared. The wind remained, however, and temperatures dropped well below freezing. But, what the heck, it was a nice night at Indian Trail Spring. Jupiter looked pretty awesome despite the wind. I was lucky enough get decent views of three distinct faces of Jupiter this year. Tonight featured the Great Red Spot near the preceding limb. In addition to the wake turbulence following the Spot in the SEB, there were a couple of disturbances to the south that looked like ovals. The eastern one had a dark spot on its following edge. The edges of the NEB also looked a bit more active at these longitudes, although the Equatorial Zone was still mostly blank. I revisited several of the comets, including C/2005 L3 (McNaught) which seemed easier tonight. I sketched NGC 5466, the loose globular cluster in Bootes, and NGC 1333, an odd reflection nebula in Perseus. Mostly I just had fun and took frequent shelter breaks from the unrelenting wind. Naked eye limiting magnitude pushed 7.3 on Monday morning. I once again failed to convince myself that I could see comet 15P/Finlay, so I gave up on that one. By the time I packed it in, there was a very thick coat of ice on the scope and the car windows, and another successful OSP drew to a close for me.